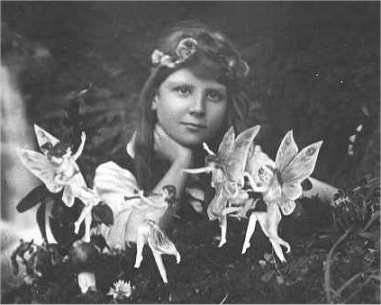 Cottingley Fairies: Totally not real. Ask any of my friends–I’m totally into fantasy and role playing games. Within my small menagerie of Dungeons and Dragons minis, you’ll find lots of elves and mages, but one of the favorite figures I own is a faerie figurine that my husband purchased for me in Disney World. And nope, it’s not Tinkerbell, though I like Tink also! The best (and most well-loved) character I’ve ever created for any purpose is a fae named Ceara. I made Ceara for an online text-based RPG called Empire of Meztrailov. After playing her at Seventh Kingdom IGE (a LARP, or live action role playing game) a friend of a friend asked me if Ceara could possibly be hired to appear at a friend’s daughter’s birthday party in the spring. Needless to say, I gave an enthusiastic “yes!” Ceara’s no Tinkerbell, but I figure it would be fun for her to appear at a little girl’s birthday celebration. Ceara’s a fae of the Seelie (Summer) Court, so you could describe her as a ‘good faerie.’ I spent a fair amount of time on creating the character and I spend hours per week portraying her online. I purchased the costume (not cheap) and invested some money in it, though I’ll get most of that money back after appearing at the birthday party. And now that the secret’s out on “True Blood,” I have to say that Sookie is one of my favorite faeries ever, and I love the way she uses her magic, especially in defense of those willing to do her harm. I love all sorts of fantasy and fairy tales, and I don’t think I need to go on about this any longer to prove it. But here’s my thing. Faeries are cute and fun and curious and mischievous and all around awesome, but they aren’t real. As I prepare to attend FaerieCon, I’m wondering how many people I’ll meet who are there just for fun…and how many people really believe in faeries? How many worship them? I’m as freakish and nerdy as the next convention-going gal, and I don’t exactly subscribe to a mainstream religion myself. But recently, I found myself in an online discussion with a business owner who was offended by the fact that I didn’t think faeries are real. I’m pretty sure I have had conversations about how cool it would be if elves and dragons took over the world again, but I’m also fairly certain that it was metaphorical (I mean really, Republicans in congress = total dragons) and that I was drunk at the time. I’m pretty liberal about stuff. If worshiping faeries is your thing, go for it! That is your right. I LOVE faeries. But they’re fun; they’re fantasy, and that’s where they stay in my life. Thanks for accepting that about me.